The LFC Explorer is an open top tour bus with a live tour guide, starting at the Albert Dock or Pier Head, the route takes in some of the city centre’s most historical sites, such as the famous three Graces including Liverpool’s Royal Liver Building were you can see the famous Liver Birds that appear on the crest of the LFC badge before making its way up to Anfield and the surrounding areas, enjoying a short stop at the best view in the whole of Liverpool from Everton park giving views of the entire city, the Wirral peninsula and the mountains of North Wales. The tour finishes outside the World Famous Anfield Kop were you can hop off and take a stadium tour and see the new Steven Gerrard collection or even book a Legends tour; you can then enjoy lunch in the Boot Room Café or just browse the Anfield souvenir shop. 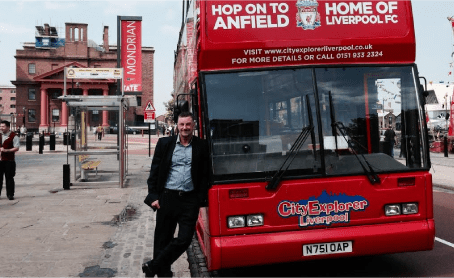 Having taken in everything there is on offer at the home of the Reds passengers can then hop back on the bus to make the return trip into the city, passing Stanley Park and Goodison Park the home of Everton FC.